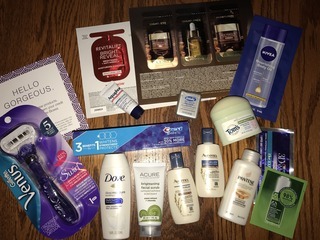 A few weeks ago I shared about the Amazon Men's Grooming Sample Box. Today I thought I would share about the women's box. I bought this with my own money so this is not a sponsored review. I'm pretty pleased with this box. I love the Acure facial scrub and use it at least twice a week so the credit could have went just to repurchase that product and I would have been thrilled. I like having some samples size lotions, washes and such on hand for travel so I used these to plush my stockpile. I'm not a fan of the packets but I think with the amount of regular samples it was fine. 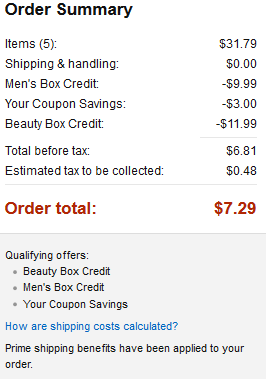 The full size razor makes this box almost pay for itself without the credit. I do think this is a good value. I've already made my reimbursed purchase and as you see the credit came off with no problem. 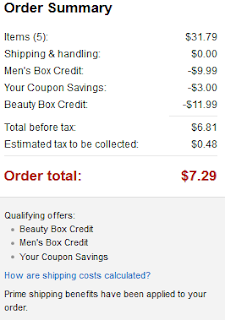 It was a little tricky to figure out how to get close to the credit without going over and most items were not free shipping (prime shipping) so I had to spend a bit more than I would if it was just the prime shipping. Will you be trying this box?